I’m strongly in the camp which expects the S&P 500 to break its all-time high opposed to forming a double top. I’m not big on technical analysis, but that would be a scary chart pattern if it occurred. However, even though I’m still bullish on the stock market in the near term, it doesn’t mean I ignore the potential negative catalysts of a correction. In this case, I’m referring to a correction in the recent upward move, not a return to the February low. Optimism is returning to equities which is a bad sign in the near term. Whether is at extreme levels depends on the indicator you review. Clearly, extremely bearish sentiment is no longer a catalyst which can push stocks up. The relative strength index peaked at 86.09 when the stock market peaked on January 26th. An overbought signal is anytime the RSI stays above 70. Clearly, the market can stay overbought for a while because it was over 70 for almost all of January and frequently was above 70 in 2017. The indicator bottomed at 27.98 on February 6th as it wasn’t at the oversold point, which is below 30, for long. When you pair technical analysis with a fundamental understanding of earnings and economics, it’s a winning proposition. Because earnings and the economy are strong, it’s reasonable to expect the bull market to continue which means the market will be overbought much more often than it’s oversold. Currently, the RSI is at 66.16 which is the highest point since the correction. The good news is the last time the S&P 500 was at the current price, the RSI was higher. If the S&P 500 makes a new record high, I expect it to do it at a lower RSI, meaning the level is less likely to inspire selling. As I mentioned, the investor surveys have begun to show optimism. The chart below shows the AAII survey has become much more bullish in the past couple of weeks, but it’s not close to any of the peaks reached when stocks became overheated in this bull market. It’s amazing to see how many mini sentiment cycles have occurred in this bull market because of its length. The expansion and bull market don’t imply everything has been calm for 9 years. Most of the time, the fear of negative catalysts has been worse than the negative events or the chance that a really bad event will occur is less than expected. For example, the Trump election was feared to be a disaster, but it ended up being a positive. The fear of a trade war 3 months ago was mostly blown out of proportion. The takeaway from this chart is to be bullish because there are plenty of neutral investors who can be convinced to be bullish which can power the S&P 500 to new highs. 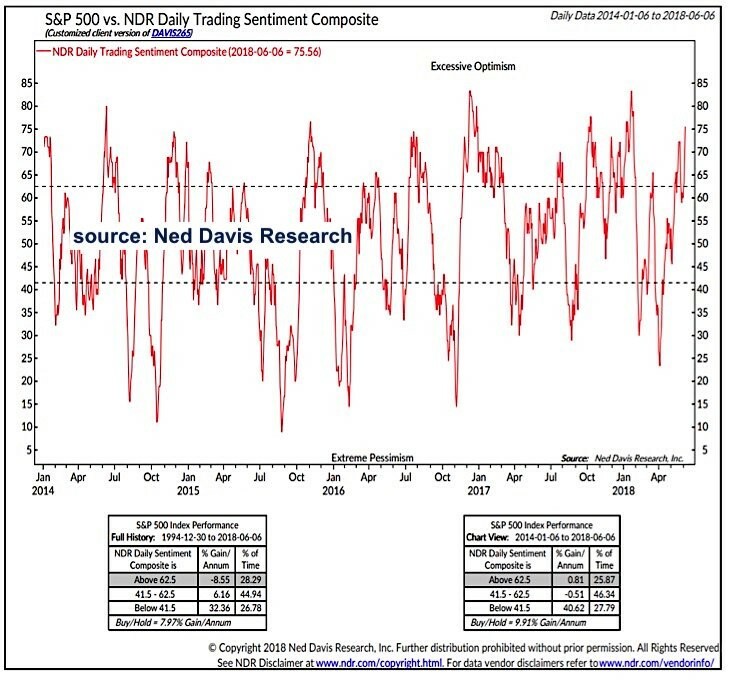 The Ned Davis Research daily trading sentiment composite index is much more concerning than the AAII survey. As you can see from the chart below, the index is now at 75.56 which is in the excessive optimism category. The tables below explain what that means. When the index has been above 62.5 from 1994-2018, the annualized loss has been 8.55%. The best time to buy was in February when the index was below 41.5. To be clear, you can’t use this index as the only way to make decisions because when the economy is crashing, there will be a lot of money to lose after this index flashes extreme pessimism. It’s also worth noting that this bearish reading can easily be washed away with a modest pullback. The performance since 2014 is important because it only uses data from the last 3.5 years of the bull market. If the bull market stays in place, the current position sees a 0.81% gain per year. Determining if the uptrend will continue depends upon your fundamental analysis. The Q2 earnings season doesn’t start for a few weeks, but investors are already moving on to Q3 earnings. Investors are on the bleeding edge of data trying to forecast future trend changes to make money. Just because the Q3 earnings forecasts are what many investors are laser focused on doesn’t mean the Q2 earnings season doesn’t matter. The Q2 earnings reports and guidance will be critical to the earnings forecasts for Q3 and the rest of the year. The important understanding here is that once you see the results for Q2 change, look at how they affect future earnings estimates. Take that extra step to help yourself become a better investor. To be clear, most of the time the results and future estimates will be correlated, but if firms report great results and terrible guidance, you will have an edge. You will know to be bearish. The Russell 2000 and Nasdaq have had great performance, but the S&P 500 and the Dow are only up in the low single digits year to date. American growth outperforming international economies along with the stronger dollar have caused this performance. However, don’t think firms with international exposure are seeing lower earnings growth than domestic firms in the S&P 500. Firms with more than 50% of their sales in America are expected to have 16.5% earnings growth and 7.4% revenue growth in Q2. Firms with less than 50% domestic sales exposure in the S&P 500 are expected to have 23.9% earnings growth and 12.5% revenue growth. 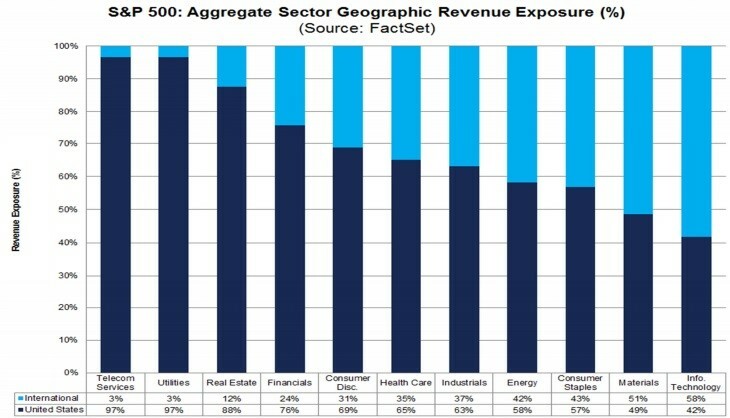 The chart below shows the sector breakdown of geographic revenue exposure. As you can see, tech, materials, consumer staples, and energy have an outsized impact on the international results. It’s common knowledge that tech has high international exposure which usually pushes overall growth up for these firms. However, don’t forget about the impact energy and materials have on the segment. Those sectors are being helped by the manufacturing recovery in America and the rising commodities prices. Plus, the perennially low growth utilities and telecom services bring down the growth in domestically focused firms. Clearly, the small cap Russell 2000 is helped by the fact that the domestically oriented small caps aren’t mostly in these slow growth sectors like this chart implies.